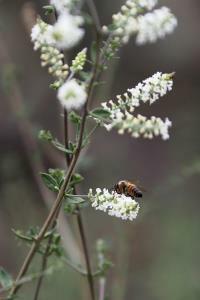 Scattered patches of Bee Brush are in bloom scenting the air and attracting the bees. Temp started at 75, low overcast, steady winds. Gradually less overcast and temp at 86. Hiked the trails out to Cogar Lookout and then followed the service roads back to Burkett trail for an easy return trip. Saw a large snake (non-poisonous) on West Potts Creek - I had been warned people saw rattlers so I was fortunate the snake I saw was NOT a rattler. I also saw four Common Nighthawks which may not sound like much but I haven't seen this once common bird in awhile so to me, it was noteworthy. Trails are still easy to see and traverse. The Bee Brush is just starting to bloom so every now and then I caught a whiff of vanilla.